Who were they and where did they come from? 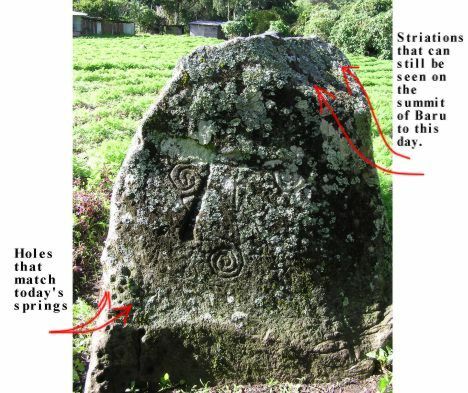 These are some of questions that spring to mind as one explores the ancient petroglyphs and sites in the Chiriqui mountains of western Panama. Archeologists have speculated and drawn some conclusions that seem to make sense – but no one can answer with certainty the three main questions, who were these ancient people, where did they come from and the final mystery – why did they disappear? 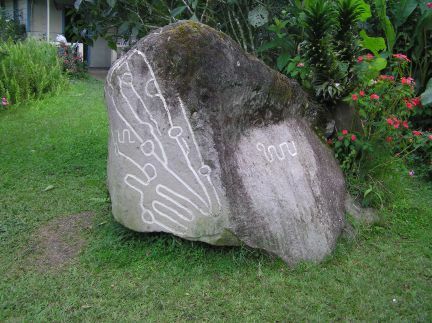 On Wednesday of this week I visited a little known petroglyph in the small mountain town of Nueva Suiza in Chiriqui. To access this remarkable stone you literally have to take your life into your hands. It lies ten minutes north of Volcan down a rough country road. First you have to cross two bridges made of rusting tin and rotten wood – at least these can support a vehicle(just) Then the test of your metal really comes to the fore – you have to cross a 100 foot wire stayed bridge that hangs precariously 20 feet over the rocks of the raging Chiriqui river. My guide on this trip was local restaurateur Gladys Castillo. Her sister Olga owns the land where the rock is situated. Gladys nimbly crossed the bridge leaving me to contemplate the rotten and splintered boards that barely pass for the bridge deck. This I thought was fool hardy and extremely dangerous. Trust me these boards could give out at any minute and result in a fall onto the boulders below which surely would break your legs and most probably kill you. Still I thought, I am a journalist-we are brave adventurous and most of us are crazy as a fox. Gingerly I crossed the river in pursuit of the disappearing Gladys Castillo. On the other side of the bridge I met Olga Castillo – the sister of Gladys. She led me through a gate and up to a corner of a field where a large rock sat next to the hedge. The rock was about twelve feet in length, six feet across and about eight feet high. It looked remarkably like a sacrificial stone I had found in Nicaragua. 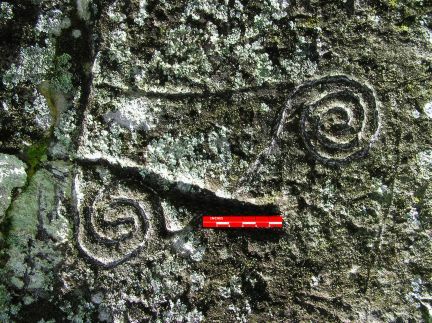 On the North side were four spiral circles, some six inches in diameter and joined by a series of interconnecting straight lines. To the bottom left of this side were small round one inch diameter indentations. The most striking aspect was in the top right corner. Here there were several vertical striations emanating from the top of the rock. This gave me the clue that these were possibly artists renditions of lava flows. My theory and evidence to support it. People throughout history have made objects to venerate, appease or honour the great forces or deities in their lives. I believe the Panamanian ancients carved the Nueva Suiza rock as a representation of their mountain god - the awe inspiring Baru Volcano. The rock is in effect a three dimensional copy of the Volcano. In ancient times lava would have flowed from the summit – hence the vertical striations at the top. The circles may well represent the pools of lava that gathered and then poured stream-like down the sides and finally the small holes at the bottom would represent the many springs that are still to be found all over this huge mountain. The mountain would have been both a taker of life with its scorching lava and also a provider of it with streams of life sustaining water. Fitting qualities for pagan worship? 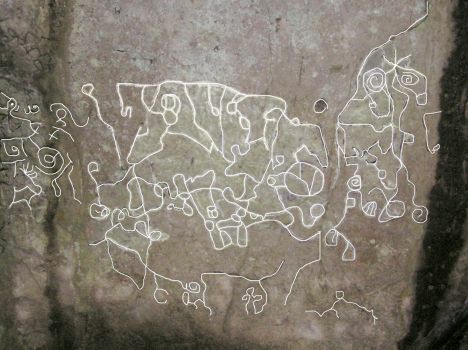 Several miles to the west lies one of Panama’s more famous petroglyph sites- Sitio Barriles. At the entrance to the site is an almost identical, but much smaller rock, with identical circles, striations and holes. Could this be another “statue” to honour the Baru Mountain god? 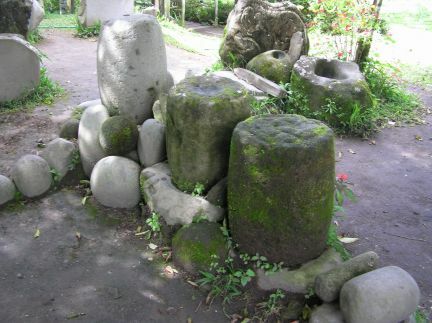 Barriles is most probably the best and most important archeological site in all of Panama. Some have suggested that the large 15 inch diameter stones barrels were in fact a forerunner of the wheel. Using the stone drums large trees could be moved over the hard rocky ground. According to National Geographic there was a huge earthquake and volcanic eruption in this area around the year 1450. The lake at the top of the Baru Volcano broke through the mountainside and cascaded down. This doesn’t seem to be an isolated occurrence there was Volcanic activity all along the isthmus of Panama. Similar petroglyphs can be seen at El Valle de Anton. My theory is that that ancients in an act to appease the mountain god found large rocks similar in shape to the mountain and then carved representations of the lava flows, vents and most importantly where the springs emanated. A look at the modern day Baru Volcano seems to match up perfectly with this ancient rock. 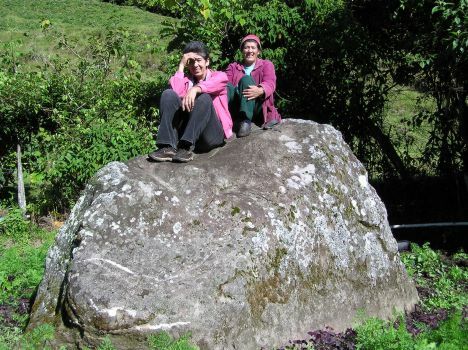 The petroglyphs at Sitio Barriles are easily accessible. 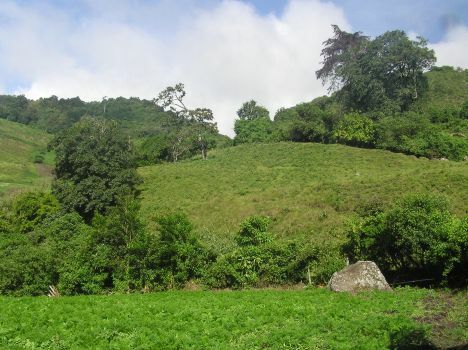 Take the Caizan road east of Volcan and after six kilometers you will see a sign. The “Castillo” stone however is only accessible by those of the “crazy like a fox” persuasion. Contact Gladys Castillo at the Castillo Restaurant (on the Cerro Punta road) in Volcan and she will happily direct you to her sisters property. Bring a camera, a good pair of hiking boots, a two dollar donation but leave your fear of heights and dangerous bridges behind.